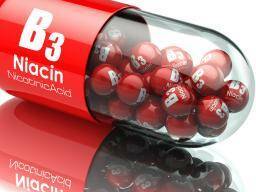 Why do we need vitamin B-3, or niacin? Vitamin B-3, also known as niacin, is one of eight B vitamins. It plays a role in converting the food we eat into energy. It helps the body to use proteins and fats, and it keep the skin, hair, and nervous system healthy. It may also reduce cardiovascular risk, because it can be used to treat high cholesterol. There is some evidence that it may reduce blood pressure because it is a vasodilator. Vitamin B-3 is also known as nicotinamide, nicotinic acid, and vitamin PP, because it prevents pellagra. Any niacin the body does not need is excreted in urine. It is not stored in the body, and it must be consumed daily. All the body’s vitamin B-3 needs can be obtained through a healthy diet. Vitamin B-3 deficiency is rare in the United States. Excessive alcohol consumption is the main reason for a lack of vitamin B-3. It has also been reported in patients with anorexia nervosa or bariatric surgery. Vitamin B-3 is also known as vitamin PP, nicotinamide, and nicotinic acid. A severe lack of vitamin B-3 can cause pellagra. Features of pellagra include skin problems, dementia, and diarrhea. It can be fatal. High doses of vitamin B-3 have been used to control cholesterol. Some studies have suggested that niacin might help to slow the progression of heart disease and atherosclerosis, diabetes, osteoarthritis, cataracts, Alzheimer’s disease and various skin conditions, but further research is needed to confirm these findings. High doses of vitamin B-3 can cause adverse effects, including flushed or itchy skin, nausea, vomiting, and constipation. It can also raise glucose levels in people with diabetes. It can trigger an attack in people with gout. It can lead to high levels of liver enzymes, and it can increase the risk of liver damage. Before taking any supplement, a person should speak to their doctor. Can vitamin B-3 help promote a healthy pregnancy? See what the research says. The National Institutes of Health (NIH) Dietary Supplement Label Database recommends 20 milligrams a day of vitamin B-3 for children and adults aged 4 years and over based on a 2,000 calorie diet. Those who eat a well-balanced diet normally consume adequate amounts of niacin. Vitamin B supplements are available to purchase online, but people should check first with a doctor to make sure they are safe to take. Dragon fruit is an excellent source of vitamin B-3. Some foods, such as breakfast cereals, are enriched with niacin. Dietitians recommend not exceeding 35 NE, or niacin equivalents, in one day. In countries where corn and rice are the main source of nutrition, pellagra is still a public health problem. Corn and rice have low levels of vitamin B. Corn and rice have low levels of vitamin B, causing ongoing problems with pellagra in countries where these are the main source of nutrition. In 1914, the U.S. Public Health Service asked Dr. Joseph Goldberger to go to the South of the U.S. to investigate and deal with pellagra. Rates of pellagra were much higher in the southern states than in the north. Dr. Goldberger inspected prisons, mental hospitals, and orphanages. He found that pellagra rates among the children, prisoners, and patients were considerably higher than rates among the staff, and he concluded that Pellagra was not an infection, but that it was probably related to diet. When brewer’s yeast was added to the people’s diets, all the signs and symptoms of pellagra disappeared. In 1937, scientists discovered the niacin connection. Niacin can both prevent and cure pellagra. Now, pellagra is rare in the U.S., because most people’s diet provides sufficient vitamin B-3, partly due to enrichment of foods with the vitamin. The discovery of niacin’s link with pellagra and the nutritional improvements that have led to its decrease feature in the Centers for Disease Control and Prevention’s (CDC) list of top ten public health achievements from 1900 to 1999.